Water culture systems may be rudimentary but there are still enormously popular among commercial and home growers. This is largely due to the simplicity involved and the fact that this is a rather cost-effective system to set up and maintain. The concept behind a hydroponic system is straightforward. The plant is placed in a container above a reservoir that is filled with nutrient solution. The roots hang down, submerged in the solution. They remain oxygenated by the air bubbles that rise up through the nutrient solution. What Does a Water Culture System Consist Of? First, there is a platform which consists of pots or baskets, where the plants are placed. These pots contain growing media as well as the upper portion of the plants. These pots are perforated so that the roots can poke through. Below this, there is the reservoir. This is a container that holds the nutrient solution that the roots are submerged in. Inside the reservoir, there is an air stone. This is what helps to create the air bubbles that keep the roots oxygenated. In some instances, a soaker hose is used instead. The air stone is linked to a hose or air line that, in turn, connects to an aquarium air pump outside of the reservoir. One of the easiest ways to create aeration is to use air bubbles and is the system that has been outlined above. Here, the air pump is responsible for creating the air volume that is carried through the hose and to the air stones. In turn, the pores on the air stones cause the air bubbles to form. Soaker hoses can be used for better results as they are capable of creating even smaller air bubbles. Another great way to ensure that the water is aerated is to rely on falling water. This tends to be a more popular option for commercial growers than home growers. This is because the water either needs to fall from a considerable height or there needs to be a significant volume of water for this method to prove useful. The sheer force created when the falling water hits the reservoir causes the water to become agitated and for a greater amount of dissolved oxygen to be made available. With this technique, growers have the option of having several containers contained to a central reservoir. This setup relies upon a flood and drain mechanism. Here, each of the containers has their own overflow or drain tube that carries the nutrient solution back to the main reservoir. The containers also have their own fill line. The water moves into the container and if there is any excess, it moves out and into the central reservoir. With this system, an air pump helps to keep the water well aerated. 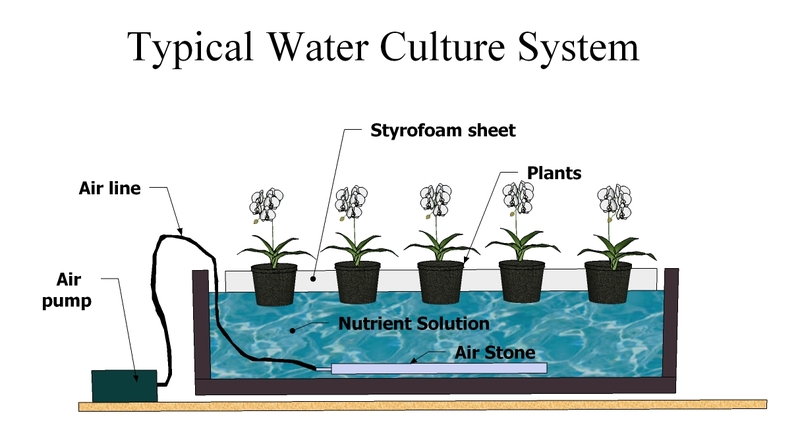 This is the basic setup of an average water culture system.